The AVR microController is based on the advanced Reduced Instruction Set Computer (RISC) architecture. 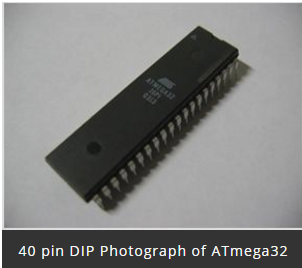 ATmega32 microController is a low power CMOS technology based controller. Due to RISC architecture AVR microcontroller can execute 1 million of instructions per second if cycle frequency is 1 MHz provided by crystal oscillator. 32 Kilo bytes of in system self programmable flash program memory. Six sleep modes: Idle, ADC noise reduction, power-save, power-down, standby and extended standby. Power on reset and programmable brown-out detection.